Chelsea attacker Eden Hazard has hinted that he could favour a potential move to Real Madrid at the end of the current campaign. The Belgium international has enjoyed a top season with the Blues with 10 goals and 10 assists in the Premier League but he has yet to commit his long-term future to the club with his contract expiring in 18 months' time. 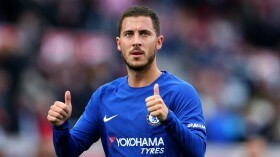 This has created doubts whether the attacker would be staying with the Blues beyond the ongoing season and Hazard has now acknowledged that he would be pleased to join Los Blancos, if the opportunity arises. "Why not? You know it very well. You're asking the question, but you know what the answer will be so you don't have to ask it,"he was quoted as saying by France Football. However, the 28-year-old added that he may not push through a Blues exit yet and there is the chance of him signing an extension, he further told: "I've always said that I wanted to explore something different after England but there are also things that might make me stay." Hazard has struggled to produce his best while featuring in the false number nine role but that should change during the forthcoming weeks with Gonzalo Higuain tipped to be signed to reduce the scoring burden. The Argentine is expected to join on an initial loan agreement from Juventus and he should thereafter take up the centre-forward position, thereby allowing Hazard to slot into his preferred left-wing role.